NEW ORLEANS — You’ve probably heard kicker Greg Zuerlein’s nickname before. Greg “The Leg” they call him. He’s hit field goals from 60 yards before — 61 yards even, back in the 2015 season. But he’s never had to nail kicks like this. The first from 48 yards to tie the game at the end of regulation with just 19 seconds on the clock. The second from 57 yards to send the Rams to Super Bowl LIII. A big kick? Zuerlein’s probably never had one bigger. And the Rams have never had one from longer in postseason history. It was just that kind of game — where Los Angeles needed its special teams unit to come through with big plays in order to defeat New Orleans at the Mercedes-Benz Superdome 26-23 and become NFC Champions for the first time since the 2001 season. The first came much earlier, when head coach Sean McVay elected to use a fake punt on 4th-and-5 from the L.A. 30-yard line. It was a pivotal moment in the game, as Los Angeles was already down by 13 after an interception ended the first drive, and a punt ended the second. Punter Johnny Hekker fielded Jake McQuaide’s long snap, cocked his right arm, and then fired a pass on the right side to Sam Shields for a 12-yard gain and a key first down. While L.A. wasn’t able to get into the end zone, Zuerlein made sure that drive turned into points with his first field goal of the day — from 36-yards out. Zuerlein would go on to connect from 24-yards out as well in the fourth quarter to tie the game at 20. McVay knew he’d get questioned about that decision — kicking it when L.A. had the ball inside the one-yard line — so he addressed it before he was even asked. The ultimate outcome proved McVay right — even though it didn’t at first look like the Rams would get that chance. After wide receiver Ted Ginn Jr. caught a 43-yard pass to give New Orleans a first down at the Los Angeles 13, the Saints were clearly in field goal range at the two-minute warning. But Brees threw an incompletion, running back Alvin Kamara took a carry for no gain, and Brees throw another incompletion — meaning L.A. had to use only one timeout. And when kicker Will Lutz nailed a 31-yard field goal, there was still 1:41 left on the clock. That was plenty of time for the Rams to get Zuerlein territory. Goff used three completions to get into New Orleans territory, and then a three-yard pass to running back Todd Gurley to set L.A. up at Saints’ 30. Zuerlein didn’t need anything more, hitting that 48-yard field goal. 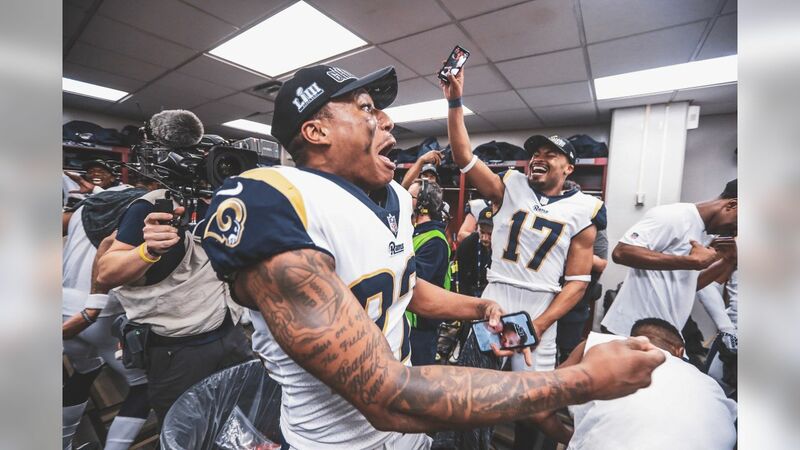 “[I] thought our team’s composure right there — you couldn’t hear anything — for Greg to be able to deliver that kick to be able to send it into overtime was outstanding,” McVay said. Goff connected with Higbee on another pass, setting up 3rd-and-7 at the New Orleans 39. And while Cooks couldn’t haul in that screen pass, it really didn’t matter. “Greg ‘The Leg’ delivers in a big way,” McVay said succinctly of Zuerlein’s franchise-record 57-yard field goal. And, really, it’s what Zuerlein’s teammates expected. Goff did it one better, and looking at the replay, he’s probably not wrong. On a day where the Rams needed every yard possible, Zuerlein said this about how far he thought it would’ve been good from. Well enough to send the Rams to Super Bowl LIII.